I agree with other reviewers in hoping that this book will become widely available in the USA; it’s very surprising that it isn’t already and also disappointing to see how few libraries have it. This is a challenging and most worthwhile book. It took two readings to sort out the details of the timeline and to get a full grasp of the many participants; I think that was because the emotional impact was too powerful the first time through to allow adequate processing of the mass of information Timothy had to dig through in order to understand for himself. There are many stories here, the central one being the immensely close and loving relationship between the author and his identical twin, Nicholas, the brutal loss of Nicholas at the age of fourteen and serious wounding of the author (and others) and the author’s struggles to grasp and accept the death of his brother over the course of more than two decades. The minute descriptions of family life and the assassination of Lord Mountbatten are interesting enough in themselves, but they serve primarily to set the background for the story of the twins and Timothy’s later life as a “lone twin”. The writing is startling in its emotional candor, which is necessary for the author to achieve his stated goal of being helpful to others who have suffered trauma and grief. Even more remarkable is the matter-of-factness with which the author describes events, his relationship with Nicholas and other family members and his emotional states as he reacts to Nicholas’s death. The writing is never cloying. When Timothy writes that he cried “buckets of tears”, it seems almost an understatement rather than excess. And the reader comes to understand that this tragedy occurred at what was probably the most vulnerable point in the lives of Nicholas and Timothy, for they were just on the doorstep of adolescence, a time when they were most closely bonded and a time when their paths might have begun to diverge. Many issues and questions arise from this book aside from those dealt with directly in the text. What is it like to be an identical twin? What is it like for the surviving twin when his sibling dies? How wise is it to raise identical twins in an environment that emphasizes their “twinhood” and, presumably, increases further their emotional bonding? Some exploration on the web helped to educate this non-twin about some of this (see http://www.lonetwinnetwork.org.uk or http://www.twinlesstwins.org). A very interesting account into the lives of the Lord Mountbatten family following his and other members of his family assassination due to a bomb which was planted into their boat in which they were passengers by the I.R.A. The author Timothy Knatchbull is a grandchild of Lord Mountbatten, and his twin brother was killed in the same tragic assassination along with his grandmother. Timothy and his parent’s sustained horrific life threatening injuries, but fortunately they did manage to survive. While written for the benefit of other bereaved twins, I think the book raises another critical question, namely the guilt of those who look away when acts of terrorism are perpetrated. Clearly, the individual convicted of the crime was not acting alone — someone else made the clear-cut decision to trigger the bomb and kill up to six innocent people whilst assassinating Mountbatten (succeeding in killing three of them). Why didn’t the Garda hunt this person, and any others, down? Why didn’t the community insist on this? I found Timothy Knatchbull’s book well worth the read. The story of how he and his close knit family faced such a terrible tragedy kept me glued to the book which I finished in 5 days. I felt like I was there as it happened. The story of his family’s courage and healing brought tears to my eyes. I do believe his grandfather, Lord Mountbatten, would have been pleased and proud to know his grandson, though injured from the accident, was able to work through a range of emotions to eventually process the tragedy and receive healing as he unearthed layer after layer of what actually happened from a number of different perspectives. I have just finished reading From a Clear Blue Sky by Timothy Knatchbull. I found myself unable to put it down, and when I did put it down the thought of it still rattled around my brain. In the book Timothy talks about his long journey, from identical twin hood, through trauma and on through recovery not only from the trauma itself but the devastating loss of what to him, was a part of him, his brother. It is beautifully written and offers clear fact finding but also shares with the reader some of the internal struggles and miseries. I think that this might make it sound sad and mawkish but it is anything but. It offers a clear view of what is really important. Relationships with the people that surround one and the book ultimately leaves one with the feeling of optimism not only that a happy life can still be achieved, but as is often the case for me, a wonder at the human psyche to recover. I bought this indelible book just by chance and have been overwhelmed by its simplicity, truth, anguish and love. I have no association with Lord Mountbatten nor his family but the contents and the author’s journey after his tragic loss left me overwhelmed and tearfully joining him at every painful stage and event. I must say that at times I found this story so distressing I had to put it down, and couldn’t read it straight through without days in between. The author describes a journey back to Ireland, primarily with the intention of being able to say goodbye to his brother, who had been taken from him suddenly and brutally. The political questions are secondary to the emotional journey of confronting pain and loss, but the author open-mindedly and generously considers the political backdrop to the events he describes and the developments of later years, rejoicing in the end of the Troubles, and accepting the resulting prominence of certain controversial political figures. This well written book is shatteringly honest and endlessly page-turning. It’s so very readable, yet so often not an easy read and at times I had the uncomfortable feeling of peering through an open window upon a family’s most private moments. However, it was impossible to avert my eyes and I must thank Timothy Knatchbull for opening them just that bit little wider. I found myself googling so many aspects of this book, in the quest for further knowledge and found how very little I really know of Ireland’s troubled history. An extremely interesting and readable book, which affected me on many levels, raised many questions, answered quite a few too, and moved me to tears in places. Having missed much of the immediate aftermath of the bomb due to his own severe injuries, the author goes back many years to Ireland to try and come to terms with the loss of his family members, and in particular with the devastating loss of his identical twin brother. After reading the book, I was able, for the first time, to imagine what it must be like to have an identical twin – and to lose one. I should think that other identical twins would find this book of particular interest. Perhaps because the author seems to have written the book as much for his own benefit as for anyone else’s, it has a very intimate feel. The events are considered in chronological order, from the viewpoint of the author himself and many witnesses, helpers, medical staff, family members and local people. The heart-warmingly non-judgmental attitude of the author and his parents that comes across in the book encourages the reader to view the situation in a rational and understanding way and makes it accessible for readers across all divides. Understanding and an attempt at forgiveness are very much on the agenda here, in a scenario where hatred and incomprehension would perhaps, sadly, be the norm. It was interesting to catch a glimpse of the conflicting emotions and the complex situation that the local Irish people had to deal with at the time and to see how much the experience affected them even all these years later. I loved the footnotes and became addicted to flipping forwards to see which people the author had spoken to again at a later date and to gain as much background information as I could. The book really took me back to that period and made me wonder why Irish history was not part of the author’s or our school curriculum when, even at my school in West Yorkshire we were evacuated at least once a week in those days due to bomb scares? Was this not more immediate and important than learning about Queen Anne chairs? I was also dismayed to discover what a large percentage of Catholic and Protestant children in Ireland are still being taught in separate schools. For some reason American publishers have not yet deigned to make From a Clear Blue Sky readily available in the US. That’s a shame, because Timothy Knatchbull’s story will find resonance among many who have endured great tragedy. Timothy Knatchbull had it all. Born in 1964 as the youngest child of an aristocratic semi-royal and very wealthy Lord and Lady, he was raised in a household of rambunctious, loving brothers and sisters. 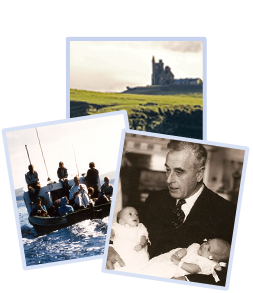 His grandfather was an authentic national hero, Earl Mountbatten of Burma, a dynamic individual who adored his grandchildren and loved to entertain them on long family vacations at his Irish castle. Best of all, Timothy had a twin, Nicholas Knatchbull, slightly older and slightly stronger, who was his best friend. They could never envision being separated for even a moment. On August 27, 1979, 14 year old Timothy, his brother, parents, grandfather, and grandmother went lobstering in the waters near their Irish summer home. The IRA, seeking to shock the British with an attack on their monarch’s close relatives, blasted the boat out of the water. Timothy’s grandfather and grandmother were killed, his parents were seriously wounded, and he himself was badly hurt, eventually losing an eye. Worst of all for him, his brother Nicholas was killed, along with their friend Paul Maxwell, an Irish boat boy. This book must have been enormously painful to write, as Timothy unflinchingly traces the events of that horrible day and his and his family’s long recuperations. But it must also have been enormously comforting and cathartic, as Timothy writes lovingly of the hard work his family, doctors and nurses, therapists, and total strangers went to, to comfort and help him. Some of the most appealing parts of the book describe the kindnesses of Timothy’s royal relatives, including the Queen herself and the Prince of Wales, making it an excellent rebuttal to the many charges of coldness and heartlessness that have been made against the Windsors. At the end we see Timothy, happily married and the father of children who remind him of his brother. I have just finished reading this book and had to write. Timothy’s account of that dreadful day in August 1979, and the aftermath, had me gripped from the first page. It is beautifully written, very sad, but also very moving. I thought it was lovely that his siblings took such care of each other while their parents were recovering in Sligo Hospital, and that they have no feelings of bitterness about what happened. Tim’s final goodbye to Nick was so sad but also very hopeful. The photo of him with his children on the beach at Classiebawn in August 2004 shows a man finally at peace. A wonderful book.